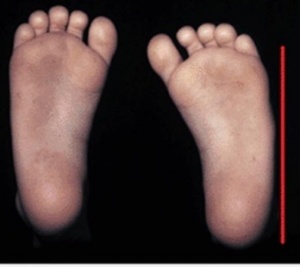 Common foot deformity seen in children which causes the foot to turn inwards. The foot appears "c-shaped. This condition is often associated with hip dysplasia. 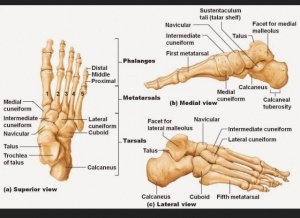 Flexible: Presents with adduction of the 5 metatarsal bones at the tarsometatarsal joint. Rigid: Presents with medial subluxation of the tarsometatarsal joints. There is valgus of the hindfoot and the navicular is later to the head of the talus. The skeleton of the foot is made of the thirty three bones, twenty six six joints and over a hundred muscles, ligaments and tendon. The foot serves primarily as a weight-bearing joint and provides a stable base of support on which to stand. Ligaments are attached to the bones which creates joints. The anatomy of the foot is divided into 3 categories: the Forefoot, the Midfoot and the Hindfoot. The forefoot is adducted and sometimes supinated , but the midfoot and hindfoot are normal. There is convexity of the lateral border of the foot, with concavity of the medial border. Older children may present with an in-toeing gait.